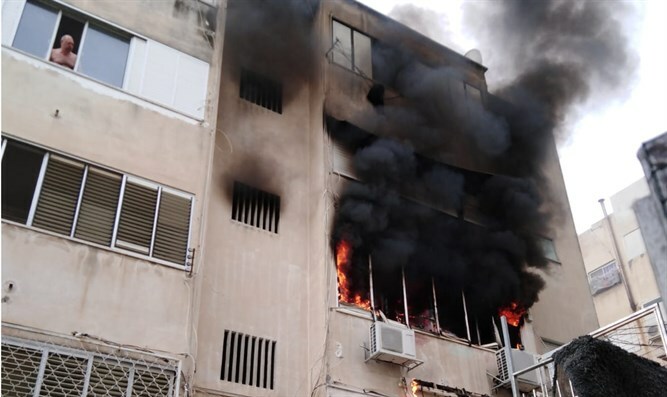 1 seriously injured, 3 in moderate condition after fire breaks out in Haifa apartment building. Thirteen people were injured Monday morning after a fire broke out in an apartment building in the northern coastal city of Haifa. The fire, which broke out in a second-story apartment in a four-story building on Ibn Gabirol Street, left a total of 13 people injured, including one person in serious condition and three in moderate condition. The remaining nine victims are listed in light condition. Five fire and rescue teams were dispatched to the scene of the blaze, along with multiple MDA emergency responder units. The 13 injured victims of the fire were evacuated via ambulance to Rambam Hospital and Bnei Tzion Hospital in Haifa. Rescue teams evacuated a number of residents trapped on the third floor of the building – one floor above the fire – including a mother and her small children. Firefighters entered the apartment where the fire was sparked to extinguish the blaze. Fire chief Rami Marom said the fire had been put out Monday morning, but added that searches continue for any residents who may still be trapped in the building.